The hippocampus is special in that it generates new neurons throughout life. This development of new granule cells in the adult dentate gyrus is referred to as adult hippocampal neurogenesis. A kinetic model of this development has been established . Therein the process of neurogenesis is composed of a sequence of different cell types. However, the exact dynamics of neuronal development in the dentate gyrus are unknown. To quantify the development we collected time-series like data. By injections of BrdU, the dividing cells were labeled and cell numbers could be counted at different time points after injection (2 h to 21 d). We determined relative numbers of BrdU-positive cells of the respective types. These numbers allow us to monitor the development of a labeled cell cohort through the different cell types over the analyzed time period. We also determined absolute cell numbers of different unlabeled populations. They do not show a time dependence, which leads to the idea of a dynamic equilibrium of cells of the different cell types on the analyzed timescale. Based on the known properties of the process and a prior model we established a detailed mathematical model containing the different developmental stages. Here we used the idea of the Leslie matrix, which is a discrete and age-structured model of population growth. The transition probabilities were found by fitting the parameters of the model to the data. We also included a simulated labeling process by which the initial cell populations are determined in a self-consistent manner based on the transition probabilities of the model. Furthermore, the effect of label dilution is included by applying a sigmoidal detectability function. The results of the model match well the data (see figure 1). 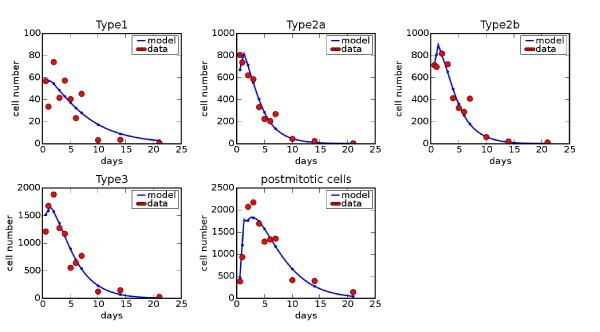 The model enables us to deduce rates for division and death of cells of the different cell types as well as properties of the labeling process. Finally, based on the eigenvectors of the transition matrix we derive an estimate for the population of unlabeled cells, which matches the experimental data well without being fitted to them. The comparison of the model output and the data shows good agreement for all cell types.